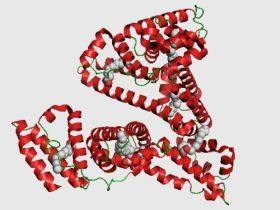 Human serum albumin is the most abundant protein in human blood plasma. It is produced in the liver. Albumin constitutes about half of the blood serum protein. It is soluble and monomeric. Albumin transports hormones, fatty acids, and other compounds, buffers pH, and maintains osmotic pressure, among other functions. This aptamer was selected with Base Pair's proprietary "Alpha" chemistry. This chemistry utilizes non-natural, modified DNA bases to give increased hydrophobicity and thereby better aptamer binding to the target.